Debru Kadane is a sub-Contractor, based in kings cross, transporting concrete on behalf of Tarmac delivering in the London region. Owner and Transport Manager Debru kadane continually observes the FORS standard when reviewing and making decisions for the business. We were introduced to FORS by Tarmac. We began to implement and review our procedures straight away to enable us to apply for Bronze. Debru kadane, passed the bronze audit and soon realised how beneficial FORS is to us as a company. FORS was and still continues to be very helpful in providing the training and tools to achieve all three accreditations, now we are going for gold accreditation, which we feel is a huge achievement. The continued improvements that have we have made since achieving our silver accreditation have been invaluable to our business, the continued procedure of using our fuel tracker to monitor the fuel usage and emissions have been really helpful to us. As an accredited FORS company we really made the most of the benefits on offer, in particular, performance management and e-learning tools, including toolbox talks. As a company I update our cycle safety e-learning course each year and another course as well, which is planned for all staff on our company training plan. The main reason for progression was that we wanted to demonstrate to Tarmac and their customers that we are capable of meeting the challenges ahead. It is important that we continue to improve the operations of the business and by doing this we are in a better position to benefit from more contracts and continued expansion in the future. I complete a Medical Declaration on an annual basis. As an owner driver I would look into recruiting by word of mouth and recommendations firstly. We have looked at all possible noise pollution generated, from the loading point to delivery point. The location of our operating centre means that our daily activities do not impact on local residences. We have researched alternative transport modes to include Hybrid and Hydrogen powered vehicles, when vehicles are bought to the market that enables us to use them for our workload, we will definitely look into the possibility, in the meantime we use Euro 6 vehicle. 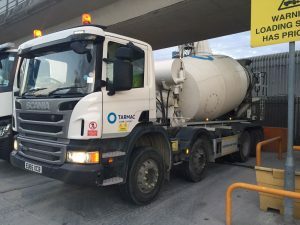 Becoming FORS Gold accredited would show that our company is dedicated to continual improvements in our service to Tarmac and their customers and going FORS Gold will show that we are a successful, dedicated business. FORS has enabled the company to run more efficiently and helped to improve skills. Going forward for the future Debru Kadane would use the advances in technology with truck and aids to help drivers in their daily tasks. At the moment we do not use social media for the business but becoming FORS gold would be something to think about in the future.